How ex-offenders get a second chance and a new career in rural Tennessee. Is it a model for Philly? Mold tech Haley George takes parts to a rack to cool after they have been molded at the JSP International plant in Tullahoma, Tenn. JSP’s U.S. corporate headquarters are in Wayne. Just over a year ago, George was in jail, recovering from a drug addiction. Now, she says, her life has completely changed for the better. WINCHESTER, Tenn. — Scott Crago says everyone deserves a second chance. That goes for ex-criminals fresh out of jail. Crago has heard all the tales of heartbreak in rural Tennessee — absent daddies, grannies raising babies, mamas dying young, drinking, drugs — and what that all means for folks locked up in the Franklin County jail. Sounds like a country-western song. But Crago, as nice as he is, has a strong interest in welcoming ex-offenders onto his payroll at JSP International, a factory making parts for cars made in Tennessee and Alabama. Franklin County's unemployment rate is 2.9 percent, making it hard to find help. Turnover is high. So a coalition of folks came up with a simple plan to keep people from returning to jail. Ask employers such as plant manager Crago what they need, listen, and supply them with workers trained to order; in this case, with industry-recognized certificates in injection molding and computer-machining fundamentals, both earned in jail. The Middle Tennessee Rural Reentry Program effort is attracting attention. Could it work in Philadelphia? Not as easily in the region's diverse economy, although similar efforts are underway, said H. Patrick Clancy, who heads Philadelphia Works, the city's workforce development agency. The city's manufacturers, he said, would have to devise a set of basic skills applicable to all their workplaces and find a way to certify them. And they'd still have to agree to enroll and hire people released from prison. In Franklin County, when reentry program graduates get out of jail, they head to the factory — neatly dressed, screened for drugs, resume in hand, ready to interview and begin working. Since January 2016, 61 have participated in the injection molding training and been released. And of those, 16 have returned to jail — that's 26 percent, compared with 80 percent, the county's usual recidivism rate. The number is even lower for successful graduates: less than 10 percent. Christine Hopkins, executive director of the Middle Tennessee Rural Reentry program, in her office in Winchester. Christine Hopkins is a relentless 82-year-old grandmother who makes a mean banana pudding and never takes no for an answer. She partnered with a county sheriff whose attitude about rehabilitation took a 180-degree turn about 15 years ago. "In a lot of places, it's not politically correct to have a law enforcement officer who believes in rehabilitation," said Sheriff Tim Fuller. "Locking people up is not the answer. Building more prisons is not the answer. I'm a firm believer that there's some good in everybody. While you have them in custody, do something with them, besides them sitting there soaking up food." In 2006, Fuller, then deputy sheriff, ran for sheriff and shared those beliefs on the stump. Listening was Hopkins, now executive director of the Rural Reentry program, who had a 50-year career in social services and workforce development. "Are you serious?" she asked him afterward. He was, and Hopkins had him hooked. For decades, she had found jobs for the disabled and the mentally ill, after they took job-readiness training, including soft skills such as attendance, punctuality and etiquette. Same for the folks in jail, she figured, developing the reentry program as a nonprofit contracted to serve Franklin and nearby counties. The inmates needed more. They needed group therapy, which helps people understand the impact of their behavior, so they change how they think about themselves and life's challenges. (In Philadelphia, a similar program is called "Thinking for a Change.") There was also training in parenting, budgeting and computer literacy. The inmates Hopkins and Fuller wanted to serve weren't the serious offenders in state penitentiaries. These inmates, housed in Fuller's county jail, were convicted of less serious crimes. Even so, he and Hopkins enrolled those most likely to wind up back behind bars. Hopkins was determined to offer specific job training and to make sure the trainees got actual jobs. She had seen too many training programs fail to lead to jobs, wasting money and hope. Working in Hopkins' favor was the region's strong focus on automotive manufacturing. In Franklin County, about 2,000 people build engines for Nissan North America, and motors and power trains for Mercedes Benz and Nissan Infiniti. An additional 3,000 to 4,000 work in automotive-related companies, such as Crago's JSP, officials say. The annual median wage is $29,173, about $14.50 an hour, possible for successful graduates. Hopkins buttonholed employers. What did they need? Graduates from the local community college's heating and ventilation program landed jobs immediately, so that was an early focus. And most inmate graduates got those jobs. But employers said they probably wouldn't hire more because residential clients didn't want the formerly incarcerated in their homes. After networking with employers, a consensus emerged: injection molding and CNC machining. Trained in a jail annex classroom, graduates earned industry and community college certificates. The secret sauce is determined mentoring by Hopkins and her staff. "I don't give up on them," said case manager Michelle Perkins. A three-year federal Second Chance Act grant of $747,619 covers machine installation and curriculum development to reduce recidivism for 120 participants. It's not cheap. But Hopkins likes to compare what graduates' wages add to the economy versus the $59 daily tab to keep one in jail. "Can you imagine the ripple effect on families and kids?" she said. "It's not about saving dollars. It's about saving lives." To entice employers, Hopkins joined the Rotary Club, the Chamber of Commerce, and the local Private Industry Council. She got buy-in before starting the program, letting employers know about government grants. No one was safe from Hopkins. She telephoned Crago nonstop until he attended a graduation and taught a class. Her tactic? Flatter them until they participate. When they do, they're hooked. "I didn't want anything to do with it," he said. "What changed me was coming to a graduation. Some of the personal stories they shared — how their childhoods were and what they went through. They were begging me, `Let me prove myself.' "
"To be honest, it makes me feel really good." And to be honest, it's not a bad deal. The program graduates dress properly for interviews. They show up for work. If there's a problem, counselors intervene. Most graduates are on parole or probation, subject to random drug testing. "I know they're clean and it's not costing me to know it," Crago said. So far, JSP, which employs 149, has hired seven graduates. Of them, two fell off the wagon and were fired, including one who had earned a promotion. That broke Crago's heart. But even so, two of seven represents a turnover rate of 29 percent, compared with his plant's normal 40 percent turnover. And, each new hire costs more than $1,000 to train. The program's rising national profile resulted in Hopkins, some staffers, Crago, and mold technician Haley George, 28, traveling to New York late last month to speak at the Training Summit for Second Chance Act grantees. For George, who got out of jail in October 2016, it represents a trip of firsts — first time in New York, on a plane, and seeing a Broadway show, Wicked. "This is so big for me," she said in October. Mold tech Haley George wipes away a tear as she talks about getting her children back during an interview at the JSP International factory. Her mother died of breast cancer when George was 18. Pregnant when she graduated from high school, she was soon addicted to stimulants, using her baby's diaper money to buy drugs. In 2011, she was arrested for theft and later flunked probation when a drug test came back hot. "I couldn't get out of bed without a pill," she said. "Instead of chasing jobs, I chased pills. In 2015, drug charges sent her to prison. While there, she lost custody of her children, now 4 and 9, who were living with a relative. 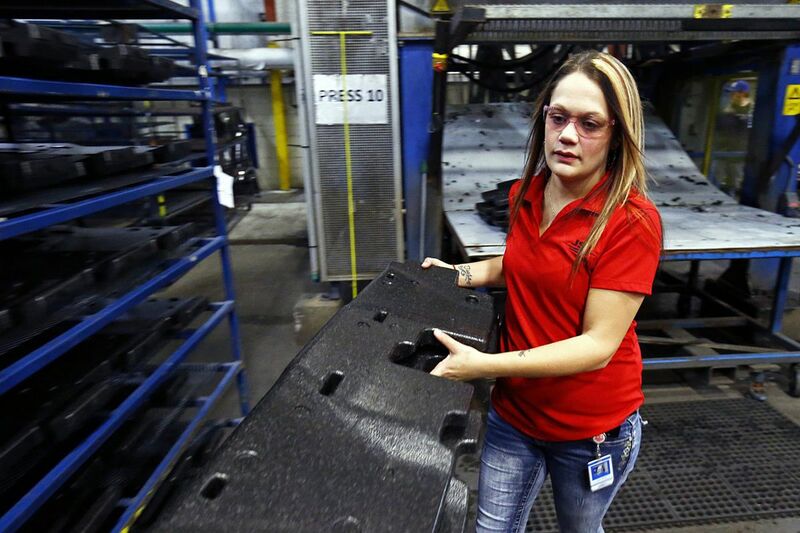 In jail, she joined the injection molding program and secured a job at JSP on her release. "I was so afraid I was going to be judged on my past," she said, "but I've never been judged. They just took me in, they loved me, and they didn't even know me. My life has been totally turned around." Last week, for example, she regained full custody of her children. Crago smiled, obviously proud. "Haley is not a number to us," he said. George strode through the factory to her machine. It hisses and steams plastic pellets into a styrofoam-like material, spitting out five platforms; each supports the rear seat of a Honda Pilot. In less than two minutes, George inspects the platforms, lines them up to dry, and packs others for shipping. In between, there's documentation. That happens 250 times a shift, six days a week. Before each shift, she inspects her machine, and if something goes wrong, she fixes it. "Press 10, that's my baby," her Tennessee twang turning baby into a three-syllable word. "I take care of Press 10, just like I take care of my kids." about the challenges — and solutions — of prison reentry in Philadelphia. Read more here.